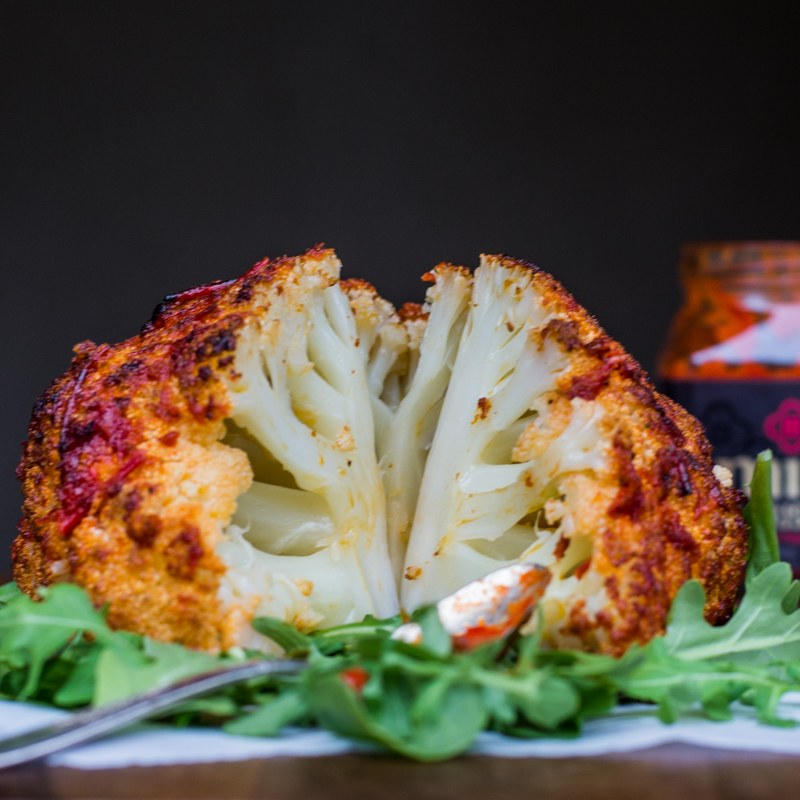 This whole roasted cauliflower will surely impress your guests at a dinner party! I have always liked cauliflower. Lately I’ve added it to some of my meals as “cauli mash” to replace mashed potatoes. I’ve also tried it out as “cauli rice” for a low carb rice option. And of course roasting or steaming the florets is a go to option most of the time. But sometimes, the simplicity of having something in it’s original state is, well, elegant and even dramatic. Don’t be intimidated to roast this beautiful vegetable whole. I had just received my bottles of MinaHarissa and knew I wanted to create something beautiful with the amazing color of the red pepper sauce. And the contrast of the red with the white cauliflower was sure to give me the elegant and dramatic look I had imagined. I knew I had to roast at a high temperature to bring out the natural sweetness in the vegetable, so I decided on 450 degrees fahrenheit. But I also knew that the core of the cauliflower inside would be harder to cook through and get soft. I had seen other recipes that called for blanching or steaming the cauliflower before roasting it to insure the core got done. But, I decided to try something different. First thing I did was to line a baking sheet or roasting pan with foil to ensure an easy clean up at the end. Next, I chose my cooking fat to coat the cauliflower. I having been using ghee pretty exclusively in my cooking lately as it tastes amazing, has a high smoke point, and is good for you! Next, I added a smoky element using Flavor God Chipotle seasoning, then I brushed on the MinaHarissa and made sure to coat evenly. In the oven for approximately 30 minutes. Okay, next step is to ensure the cauliflower core gets tender. To the baking dish, add about 1/2 cup of water or about 1/4 inch of water in dish, season top with more Flavor God or just sea salt, and cover with ovenproof lid or foil. Roast another 20 minutes and then check with a wooden skewer in the middle. It’s done when the skewer slides through easily. Make sure to let it cool for at least 5 minutes before cutting through as it will be very hot! Enjoy as a side dish to any meal. This one is sure to impress your friends! Preheat oven to 450 placing rack in lower third, and line baking dish with foil. Remove green leaves and cut off bottom of stalk so cauliflower will sit flat in baking dish. Pour/brush melted ghee over cauliflower and sprinkle with chipotle seasoning or salt and pepper. 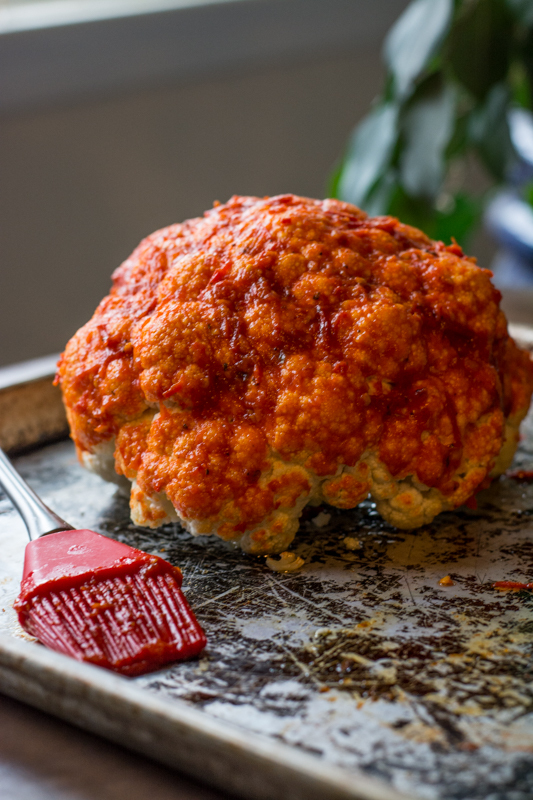 Using brush, add a layer of harissa evenly oven whole cauliflower covering completely. Take out dish, season with more chipotle or sea salt, and add water to dish, then cover with foil or ovenproof lid. 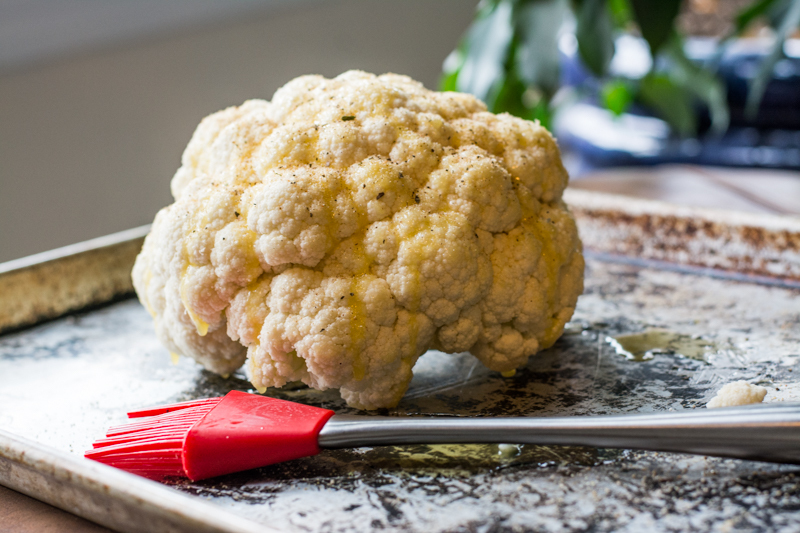 Roast another 20 minutes or until wooden skewer can be inserted through cauliflower with ease. Let rest for at least 5 minutes before cutting into to serve. Enjoy with any meal for an elegant dinner!